A spate of defiant Iranian women have taken to the streets of Tehran to protest against compulsory veiling. Photos of their demonstrations have been widely circulated online under the hashtag #دختران_خیابان_انقلاب (translated to #Girls_of_Enghelab_Street). As of the afternoon of January 29, at least two women (of the six women appearing in the photos) have been arrested. Women in hijab protest on Monday, January 29. Mashup up of #دختران_خیابان_انقلاب images from Omid Memarian’s Twitter post. The protests come on the heels of a similar move by an Iranian woman named Vida Movahed, who was arrested on December 27, 2017, after a photo of her silently waving her hijab above her unveiled head on Tehran's Enghelab Street (“enghelab” means “revolution” in English) went viral. Movahed was released from prison on January 27. Following the 1979 Islamic Revolution, the hijab became compulsory in various stages. The law was first introduced in March 1979; Iranian women, initially in support of the revolution against the monarchy, came out in the hundreds of thousands to rally against it. The following year it became mandatory in government and public offices until 1983, when it became mandatory for all women. The photo of Movahed's hijab protest, standing atop an electrical box on Enghelab Street, went viral in the context of a wave of anti-government protests that swept the country beginning on December 28, 2017. But Movahed's defiance was, in fact, a mistaken icon for the nationwide protests. She had, in fact, performed the act as part of her own singular protest on December 27, 2017, for the White Wednesday campaign, in which Iranian women posted photos online of themselves wearing white while discarding their headscarves with the hashtag #whitewednesday. This was part of the My Stealthy Freedom movement founded by exiled journalist Masih Alinejad against mandatory hijab for women. The girl from revolution street has been freed. When I returned to the prosecutor's office to follow up on the case of the girl of Enghelab Street, the head of the prosecutor's office told me she was released. I am happy to hear that she returned home yesterday. I hope this judicial case will not be used to harass her for taking up her rights. She has done nothing to justify prosecution. Please do not lay your hands on her [directed at authorities]. 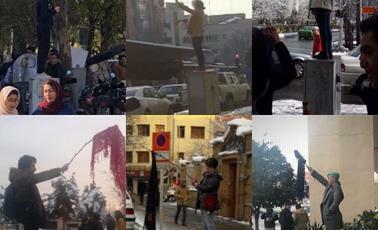 Other women took similar stands, taking off their hijabs on different streets in Tehran, and in one instance in Isfahan, a city in central Iran, according to crowdsource reports on Nariman Gharib's www.enghelabgirls.com. However, the symbolism of the initial protests taking place on Enghelab Street, translated into “Revolution Street”, was not lost on those following the events. By the afternoon of January 30, several more women were spotted in Tehran taking off their veils, in addition to a man. My Stealthy Freedom, which organized White Wednesday, the campaign that Movahed was participating in with her original act of defiance, was founded by Masih Alinejad. 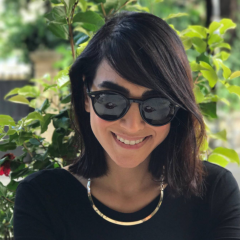 Alinejad and her movement are controversial in Iran, and sometimes subjected to smear campaigns by Iranian media, and associated with opposition activism inside of the country. I am a chadori [wearer of a full-body-length cloak called a chador]. I have chosen for myself to be veiled, not for the force of my family, nor for my environment or conditions of my work. I am very happy with my choice but I am against mandatory hijab and I support the #Girls_of_Enghelab_Street. With religion and hijab there should be no force. #Girls_of_Enghelab_Street are neither overthrowers, followers of Masih Alinejad, or the recipients of any money. They are the girls of this Iranian land who are following their basic rights.